We have always known that eating fruit is good for us, but it is only in recent years that scientific research has pinpointed why that is. 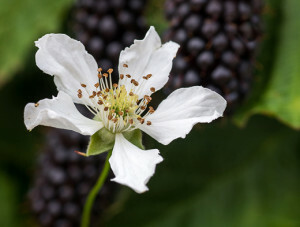 We now know that there are high levels of what have been termed nutraceuticals – powerful health-giving properties – in fruits such as boysenberries. We’d all like a magic cure to help us prevent disease and live longer wouldn’t we? Some form of medicine or agent that would keep your brain active well into your twilight years, as well as preventing illnesses such as heart disease and cancer? Well the answer isn’t a man-made pill, or an exotic plant, but – the simple berry. Fruits such as boysenberries, blackberries, blueberries and raspberries are increasingly being recognised as a source of nutrients that can improve your health and quality of life. Scientific studies are constantly reporting on the latest finds about the properties of these fruits and how they help fight disease and keep our bodies fit and healthy. Anthocyanins – boysenberries contain high levels of anthocyanins and current research has linked anthocyanins to improved eyesight, reducing inflammation, protection from cardiovascular disease and from the effects of ageing. Ellagic acid – boysenberries contain high concentrations of bio available ellagic acid which has been shown to have potential anti-carcinogenic properties. Dietary fibre – a carbohydrate-like substance found only in plants. Its benefits include maintaining a healthy gastro-intestinal tract, assisting to reduce blood cholesterol levels and lowering the risk of heart disease. New Zealand boysenberries also have high antioxidant activity, which can help prevent and/or delay major degenerative diseases. It’s believed that the combination of phytochemicals such as vitamins, anthocyanins and ellagic acid working together make them so effective. So, not only are boysenberries delicious and sweet, but they’re exceptionally good for you. And with negligible fat content, they tick all the boxes for maintaining a healthy, nutritional and well-balanced diet. Boysenberry ingestion supports fibrolytic macrophages with the capacity to ameliorate chronic lung remodeling. Boysenberry’s may be of benefit to asthma suffers. The following presents the typical composition of major types of boysenberries. This is provided as a guide for product formulation and is based on the NZ Food Composition Tables (3rd Ed). The majority of interest in nutraceuticals comes from US health statistics, where it has been shown that what we eat is implicated in six of the ten leading causes of death in the US (heart disease, cancer, stroke, diabetes, atherosclerosis, and liver disease). So, the old adage of “you are what you eat” is most definitely true! And as the link between our food intake and our health continues to be researched, berries are increasingly being recognised as a key food for maintaining our good health. The good news also is that processing berries, by either cooking or freezing them, does not alter the nutritional and phytochemical properties they contain when fresh. In fact, in some studies, it has been shown to actually improve them. So, mix in those boysenberries to your muffins, pies and smoothies to ensure you are not only getting your daily intake of important nutrients, but satisfying your sweet tooth as well – nutritious and delicious.